Prague-based 'Leaders' magazine has published an article with pictorial coverage of the election of the Grand Master in November last year in Orleans, France. Download in PDF format here or on the magazine's website here. 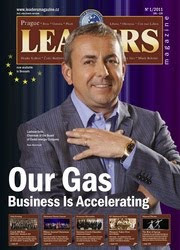 "Leaders Magazine focuses on lifestyle, interviews, business, culture and luxury products. Our readers are people from diplomatic society, government officials, decision makers in business, Czech citizens with higher income and tourists".